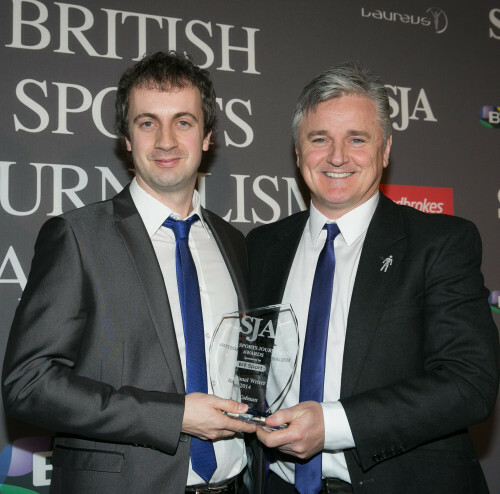 Jon Colman stepped up to the stage at the glitzy awards dinner in London to accept the SJA’s Regional Writer of the Year award again. It was the prize for his work for 2013, and the fourth time that Colman, from the journalistic outpost of Carlisle, had managed to win it, a record. The evening’s compere, John Inverdale asked, not unreasonably, whether he’d ever been tempted to leave Cumbrian Newspapers for the bright lights of London, Manchester, or even Birmingham. Actually, Colman – he was born in Whitehaven, grew up in Hayton, a village 40 minutes from Carlisle, and other than four years at Lancaster University, he has always lived in Cumbria – does admit to being open-minded and ambitious. Since Inverdale asked, Colman has won the award yet again. But he’s still firmly rooted in Cumbria. There have been “a few conversations” but none that have led to anything so far – and he does have a job that he loves. At 34, Colman has never seriously considered any other way of earning a living: “From a very young age I was fascinated by both sport and words, at the expense of learning anything practical or useful, so I was always inclined that way. As I was growing up, without realising it, I absorbed the words of the great Ian Wooldridge and Patrick Collins. I went down the usual route of working for the school magazine and university paper, which I edited for a year full-time. I then volunteered at the 2002 Commonwealth Games on the main media team, which was a fantastic experience with some great people. “A few weeks later I was fortunate to be offered a trainee reporter job at the Whitehaven News after a period of work experience – and even more fortunate that they put me through all my NCTJ training. “I’ve always written about sport, from school to the present, and it was always my ambition to do it for a living from the moment I realised that playing for Carlisle wasn’t going to be an option – there have been times recently when having two left feet has seemed a prerequisite at Brunton Park. But sadly, not in the mid-to-late 1990s. “Although I enjoyed news, I was a fairly average reporter at best at Whitehaven – I was more interested in getting some sort of foothold in the sports pages. Eventually I was allowed to write some features, was given a column, and was awarded some freedom to write at length and develop a style. I appreciate how lucky I was to be encouraged in this way when the editor would have been perfectly entitled to tell me to bugger off and get some proper stories from Sellafield and earn my keep. Overall it was a good grounding in many disciplines and helped me get the job I’m doing now. “I started covering the club in 2005, a couple of months after they won promotion back to the Football League following a season in the Conference. It was a great time to start on the Carlisle United beat as the club had just emerged from a very bleak period, and had positive owners and a manager and players with great potential. Like every regional sports reporter covering his local club, there have been occasional difficulties in his relationship with Carlisle. “If you’re doing your job properly you simply can’t spend 10 years covering a club without a few frosty times. To begin with it was a breeze because the team was successful and most at the club were very media-friendly. More recently times have been more difficult, which inevitably means more critical articles, more stories the club hierarchy don’t like, and the infamous marks out of 10 dipping somewhat. “I’ve had differences of opinion with every manager I’ve worked with, a couple of blazing rows with some, had a player nearly swing for me in a club – he was drunker than me, so I managed to avoid it – and at various times I’ve not been very popular with the current owners. But even in the worst periods there have always been people at the club who have understood the job I have to do and have been very helpful. How does he tread the tightrope between maintaining objectivity and preserving the trust that the club – owners, manager, players – must have in him? “By not being underhand, and trying to be up-front with any criticism, I guess. There are times when things are going well that you have to fight the fan in you from coming out too much, and equally it can be difficult not to go overboard when the team is on a dreadful run. But with time and experience you learn. “I read one of the nationals’ sports editors say recently that he wished he had been a bit more pragmatic when covering his local team, and I think it’s fair to say you have to know how far to push things in either direction. You can’t turn up to the club several times a week and expect any kind of relationship if you’re flying kites all the time or slagging people off. Equally you don’t want to become a club mouthpiece, which does happen in some places and is always sad to see. It is a fine line and you have to walk it all the time. “One of the joys of covering a club like Carlisle is that you don’t have to fight through battalions of press officers to get access. I have the greatest respect for writers covering Premier League clubs for this reason. But even in the lower divisions there seems a much greater inclination than before to try and control, or make unreasonable demands of, a journalist. This isn’t always about press officers, either. “Among certain managers and executives ­– not so much players – there is too often an absurd, panic-stricken need for blind ‘positivity’, and too many times when anything critical or questioning is attacked as ‘negative’ or ‘unhelpful’. Which stories that have given him the most satisfaction? “Generally I don’t think it’s healthy to dwell for too long on things you’ve written, although it’s always nice when readers say they’ve enjoyed a column or an interview. “I suppose there are a couple which I am proud of, as they made a little difference. 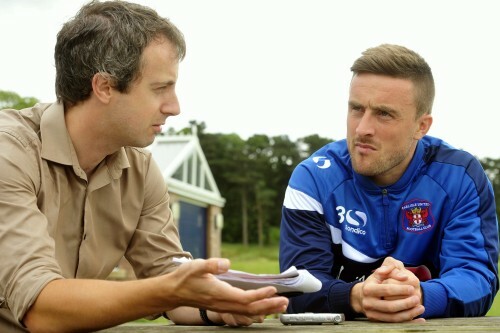 One was an interview with the former Carlisle captain, Steve Hayward, about his young son, who had leukaemia. That prompted some supporters to raise some money for the hospital who had looked after his boy, which was a wonderful gesture. And any regrets about something he’s written? What’s the most memorable match that he has covered? Is there any sporting event outside of football he would like to cover? Even in his own young career, Colman has seen great changes in our industry. “When I started on the News & Star we were just beginning to get the hang of web coverage and it was all a bit cumbersome. I also had to figure out a labyrinthine system that would send out goal updates via SMS to a small handful of subscribers. I could be staring, baffled, at my laptop for a good 10 minutes while the game went on. If it was a five-goal thriller I would just punch myself in the face and then have a loose stab at describing goals I had barely seen.